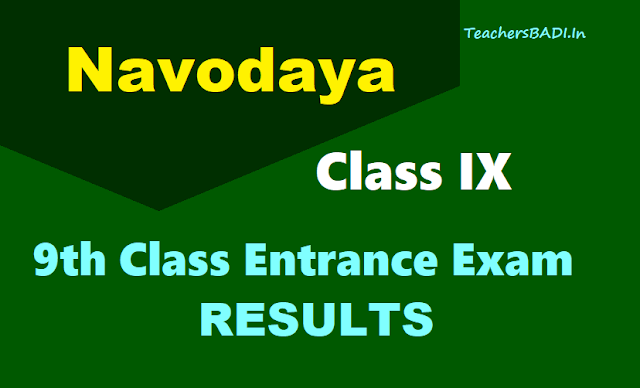 JNVS Navodaya 9th Class Lateral Entry Test 2019 Results, Navodaya IX Class Entrance Test 2019 Results, NVS 9th Class Entrance Test 2019 Results, Results of Navodaya Vidyalaya Samiti Entrance Test 2019 for 9th Class admissions, JNVS 9th class Admissions 2019-20. Navodaya 9th Class Lateral Entry Test 2019 for admission into JNVs during the Academic Year 2019-2020: NVS Hyderabad region issued the Navodaya Vidyalaya Samiti Entrance Test 2019 Notification in the month of October. Jawahar Navodaya Vidyalaya Samiti Hyderabad Region invited the applications from the eligible students for admission to Class IX of Jawahar Navodaya Vidyalayas of the District, against the vacant seats, which are likely to be available during the academic year 2019-2020. Navodaya Vidyalaya 9th Class Entrance Exam Result 2019 declared; check Merit List: Jawahar Navodaya Vidyalaya has announced the Navodaya Vidyalaya 9th Class Entrance Exam Result 2019 (JNVST 2019) on its official website. The JNVST 2019 is conducted by the Navodaya Vidyalaya Samiti to take admission in Class IX in Jawahar Navodaya Schools in India. The admission is through an All India Test, which would be held on 02-02-2019 at 10.00 hrs. in Jawahar Navodaya Vidyalaya of the district concerned. The medium of test is English/Hindi. Result of the Selection Test will be notified in the Vidyalaya Notice Board as well as published in selected local newspapers on or before ....(Tentative). Selected candidates will also be intimated by post. I have appeared AP PWD Officers & Subordinates Test in 11th June,2017 and got 46 in paper 137 & 38 in paper code 142. Please confirm Am I passed the test?